Stylish and elegant are two great words to describe the Carlyle Side Chair that Armen Living has created. 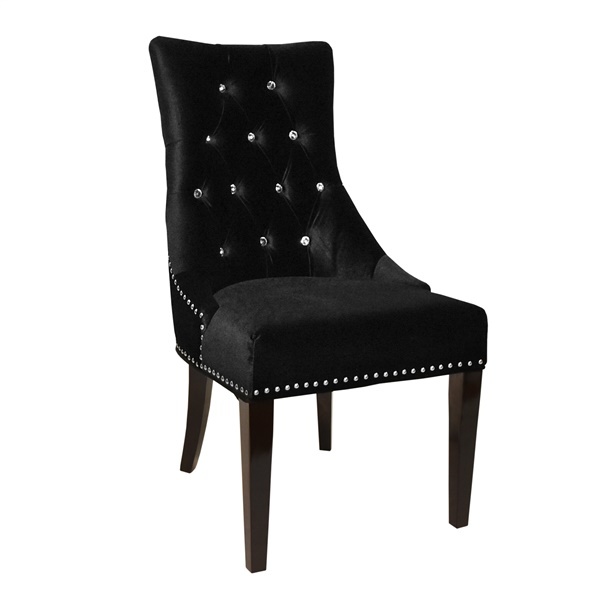 This rich, beautiful velvet dining chair will easily store when the guests have gone or you can use them around a game table or dinette. With thick and comfortable foam padding which is fire retardant and meticulously upholstery, this chair comes in a variety of colors to ensure that it will fit in any d�cor. Finishing off the look are the nail head accents and the quality wood legs to provide a comfortable and stable chair. Unique design for the modern, retro, or eclectic aesthetic. Meticulous upholstery in lush velvet. Your choice of bold hue. nail head accents for added shine. Stable legs of quality wood.